Most people, particularly children, love to look at adorable little bunnies in pet stores. During the Easter season we are inundated with commercials and advertising featuring rabbits, as well as candies and bunny-themed Easter events. Unfortunately, admiring rabbits and giving in to children’s pleas are two very different things. Caring for a rabbit is a huge responsibility and impulse buying one can be devastating for a family and for the rabbit. A common myth that many people believe is that rabbits make good pets for children. Rabbits require much more care than most people expect, and if parents think that they can put a bunny in a cage in the child’s bedroom and forget about it, they are very mistaken. These animals are much more like a dog or cat than a hamster, and need to be monitored by adults who have been educated about their proper care. Some of the things that people don’t always consider are that rabbits need daily cage or litterbox cleaning, fresh vegetables, clean water, and brushing. They also need time out of their enclosure for several hours a day in order to exercise and socialize. These are things to consider for families who vacation frequently. There is no day off from caring for these animals. Rabbits can be messy and destructive. Many rabbits will use a litterbox but some will not, or they will partially train and still have accidents. Rabbit urine can be very smelly and can leave stains and discoloration on wood, rugs, and even metal. Rabbits frequently mark their territory, especially if they have not been spayed or neutered, by spraying urine and leaving feces. Depending on the species, rabbits shed a tremendous amount of hair. They require frequent brushing and even then will leave wispy hair on clothes, carpeting, and furniture. Because of their complicated dentition, rabbits love to chew on anything available. This includes furniture, drapes, carpeting, wires, or any object left in their territory. While some rabbits are more destructive than others, they all have the potential to destroy valuable property as well as cause themselves serious injury. Rabbits are a prey species which means that they are naturally afraid of getting eaten. If a rabbit is feeling scared or threatened, it will bite and scratch its handler inflicting painful wounds. If picked up incorrectly, they can also hurt themselves by thrashing and kicking with such force that they dislocate their backs. This is a painful and usually incurable traumatic event for a rabbit. Rabbits live a long time, 9 to 12 years is the average lifespan. When a child promises to love and play with a bunny at age 11, they may not be thinking about the changes life has in store for them over the next 10 years. Many rabbits languish in homes where they do not get let out of the cage and have no personal attention. Animal shelters are inundated with abandoned rabbits whose owners failed to foresee the commitment involved in owning a pet rabbit. If the entire family, including adults, does not want the commitment involved in owning a pet rabbit, they should not purchase one. Rabbits require veterinary care. 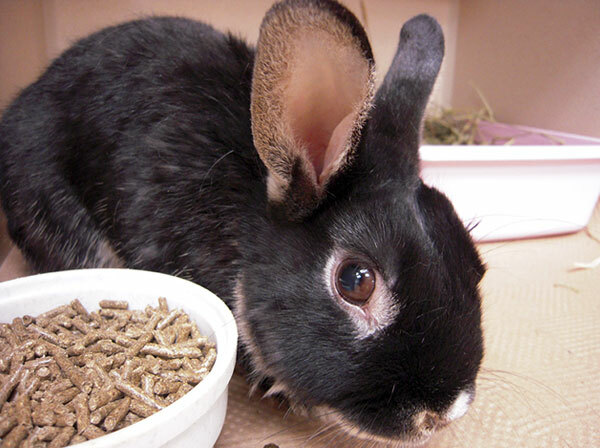 The first thing a new owner should do is take their pet to a rabbit savvy veterinarian. During the visit, a doctor will perform a thorough physical exam and check for internal and external parasites to ensure that your new pet is in good health. A vet will also educate you about how to properly care for your rabbit by discussing topics such as: appropriate diet (pet stores are notorious for selling unhealthy diets for rabbits), exercise requirements, picking up and holding your bunny safely, nail trimming, signs of illness, litter training, and much more. This is an invaluable service that no new pet owner should do without. Your pet will also need to be spayed or neutered in order to avoid problem behaviors, unwanted pregnancies, and serious health risks as they get older. If your pet does get sick, you need to be prepared for the cost of veterinary care. Due to the fact that rabbit medicine is considered a specialty and not all vets are equipped or educated to care for them, rabbit veterinary care can be as expensive as or more expensive than dog and cat care. If after reading this, you are still considering adding a rabbit to your family, than you may actually be a good candidate for rabbit ownership! Rabbits are intelligent, playful, social, and can be wonderful pets. In the right environment, a rabbit will learn to trust humans and forge a rewarding bond with a family. So when you are faced with the adorable bunnies that are so abundant during the Easter season, consider all of these factors before making a purchase. Also remember that there are many shelters that house hundreds of abandoned, wonderful rabbits here in the city. If you are prepared to share your home and life with a rabbit, consider saving a life and adopt!